Here are some powerful tips that you won’t find in the typical guide to doing interviews on radio. 2. Work with props. Again, this may sound a bit odd since your audience can’t see them. But it’s a way to support the powerful visual imagery created by radio. Keep in mind that ventriloquism hit its peak of popularity with Edgar Bergen and Charlie McCarthy on radio! It didn’t matter whether the ventriloquist’s lips moved—it was all about using props to create a vivid character that the audience would remember. Sometimes the prop choices will be obvious. If you’re talking about preventing concussions among high school football players, you should bring in a football helmet—ideally one with accelerometers or other sensors in it. But there are other times when you can use a non-obvious prop to make a powerful point. For example, one of my clients did a national tour talking about ways to reduce young children’s anxieties. He brought a small clip-on stuffed animal—a two-inch tall koala—as a way of showing how parents can use what psychologists call “transitional objects” to help children handle stress. Even though the prop didn’t make any noise, it provided a vivid image that both my client and the program’s host could work with. 3. Don’t talk to the audience. Of course you should talk to the host, but that’s not my point. Radio is inherently an intimate medium. You may have thousands or even millions of listeners, but they can’t see or hear each other. Think of radio as more of a one-on-one conversation rather than as a presentation to a group. If the tone of your voice sounds like you’re giving a speech, you’re not being effective. That’s one reason why you should never, when talking to a host, use phrases like, “your audience.” That’s treating the listeners as if they are listening in on a conversation between the two of you instead of directly taking part in it. 4. Don’t promote your book/program/event. 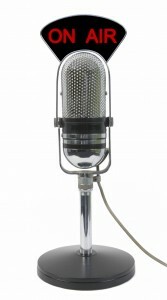 The most common reason for seeking radio publicity is to promote something. It’s effective, cost-efficient, and generally a good idea if it reaches the audience you’re seeking. Most guests on radio talk shows who try to promote something sound either desperate or like used-car salespeople. Keep in mind that it’s the host who has the ongoing relationship with the audience. That’s why you want the host to be the one who plugs the book, program or event. To do this, you need to take control of the interview and lead the host to a place where he or she has to help you out, and sounds good doing it. For example, let’s say that you’re a hospital that has a new website with information on services that can help prevent or reverse childhood obesity. You’ve given the host and the producer information about that website ahead of time. Instead of plugging the website yourself, say something like, “You know, Bob, we have a lot of useful information for parents available for free on our website.” Then stop talking. To keep the conversation going, and to avoid angry calls and emails from listeners, the host either has to provide information on the website or ask you to do so. This gives you the host’s tacit endorsement, which can be very valuable. 5. The least valuable part of the radio interview may be the radio interview. Radio is an ephemeral medium. Your words are broadcast and then disappear into the ether. For you, the greatest value of a radio interview may come in secondary use of the segment, such as incorporating it into a website. You’ll need permission of the broadcast station to do this, but it’s almost always granted since it costs them nothing and they derive benefit from it. This means that you should keep such secondary use in mind while you’re preparing for and doing the interview. Focus on providing useful and practical information instead of promotional material. If you do that, then the host will probably comment on the value of what you’re saying, which is much more powerful than if you did so yourself.